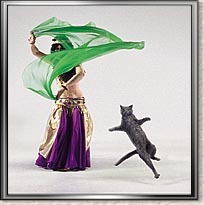 This entry was posted in Ameera Unveiled, Bellydance, Musings and Amusements and tagged Ameera Unveiled, belly dance, blog, blogs, BQB Publishing, humor, Kat Varn, Where Writers Win by KVarn. Bookmark the permalink. Kat! I cannot wait to read this book of your heart. Live your passion, Girl! That is the message below the surface, girlfriend. Live your passion!!! Don’t be afraid of facing the lines drawn in the sand… they do disappear when you turn your back on the rising tide. Got all those saved in boxes…. including your little girl stuff. (payback is all good when you are not the mom…. ) Need a sweet feed roomy jumper? Has a cow on it…. Can’t wait!! !….is that Hollywood in the picture in the ninja attack mode? Nope… it is me beside my dance instructor, silly! Hollywood only does beagles and Chaz….